You can see miles of this rocky terrain from Sandstone Bluffs Overlook. West of Taos, the roads narrow, the tourist luxuries wither, and my urge to explore surges. You never know what you’ll discover here. Eight miles out of Taos on U.S. 64, the flat, blue-green valley abruptly implodes into a basaltic gash 650 feet deep: the Rio Grande Gorge. I walk across the spidery two-lane bridge―you’d be a bloomin’ idiot to drive and gawk―marveling at the silvery scribble of river in another world so far below. A Taos hiking buddy, Howard Greene, knows a route into the gorge, so we mount an expedition. We hike down a surprisingly gentle trail, passing through stunted piñons to a Ponderosa coppice and a fetchingly derelict bridge at river’s edge. I’ve found other passages to the river on previous trips, and they always manage to yield surprises. A secret hot spring, a cluster of petroglyphs, a moving memorial to a kayaker who misjudged the river’s power―it’s impossible to overestimate the Rio Grande’s arterial role in the life of New Mexico. On to another powerful canyon: Chaco. It’s a long (230 miles), lonely, 4 1/2-hour drive, first on two-lane blacktop, then on a graded-dirt road. Chaco Canyon’s current isolation seems ironic: 900 years ago, Chaco was the most important political and ceremonial center in the Southwest. Today protected as Chaco Culture National Historical Park, Chaco Canyon’s ruins pose questions that resonate in my mind for weeks afterward. Why did its builders construct roads up to 30 feet wide, radiating to satellite communities as distant as 60 miles? How did the leaders command the labor to build “great houses” stacked three to five stories high? And why here, in a desolate gulch that gets 8.7 inches of rain in a year? 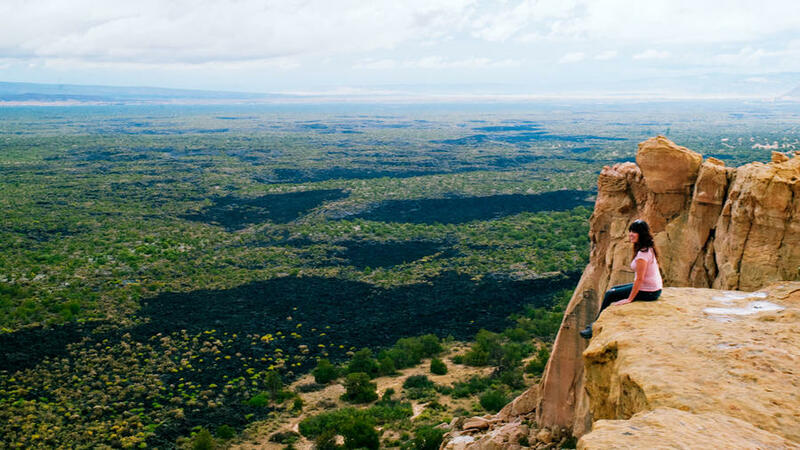 There’s more to the Chaco world than commonly known. The National Park Service quietly maintains several outlying great houses not connected to Chaco by modern roads, but directions are available at the visitor center. The next day, 140 miles south, I visit El Malpais National Monument. Malpais translates literally as “bad country,” which decidedly it would have been during the last volcanic eruption, 1,000 to 3,000 years ago. But it’s wonderful country now, a beast-and-beauty marriage of craggy black lava and graceful pink sandstone. More lonely country: In the fall, a ranger tells me, there are even fewer visitors to the Malpais than in summer.